Do you live in the United Kingdom and suffer from an opiate addiction? Heroin and other opioids, particularly prescription drugs like hydrocodone and oxycodone, have been at epidemic levels in the world. Addiction to opioids has been a regular sight at drug rehab facilities and drug detox clinics everywhere. Since it is common, the challenges towards helping people with a substance use disorder, the clinical term for an addiction, remain the same wherever a person is treated. One of the main challenges with treating people with a substance use disorder is the trouble with withdrawal. The withdrawal process is often thought of as the hardest part of recovery. It is uncomfortable, painful and in some cases can be life-threatening. Withdrawal is often the reason that some people keep using; they want to avoid withdrawal symptoms and will do anything they can to avoid feeling so bad. While most withdrawal symptoms are over within a week, some of the mental ones are more long term and can last up to a year, like the cravings people experience for their drug of choice after they stop using. The good news is that there is medication available in Naltrexone implant clinics to help people get through the withdrawal period a little easier. First, a bit about the withdrawal process. This is the part of recovery where the person is getting the drugs out of their system for the first time. They have been using opioids for so long that their body has adjusted to them and gotten used to them. It is so accustomed to having drugs in the system that it now needs the drugs just to feel normal. When the drugs are not present, the body is out of balance and will experience mental and physical symptoms as a result. It is important to remember that while uncomfortable, the physical symptoms will be over within the space of about a week, depending on the individual and how long they have been using. Their severity will also depend on the individual and use as well. Fortunately, as the body became accustomed to having opioids in it, the body will reset itself back to having a state of normal without drugs. A very serious part of the withdrawal process, which can typically last a year, is the cravings for the drugs. Cravings are the desire for the drug and to start using again that the body experiences. It is like an echo of the past use that still reverberates around the body. These are unwanted and sometimes unconscious thoughts that come unbidden into the mind. The individual will be doing one thing like focused on work, and all of a sudden they are thinking about popping pills and that feeling again, to the point they are sweating and breathing hard. This is a normal part of the withdrawal process and does not mean their recovery is in jeopardy. Cravings can also come in the form of using dreams, where a person is dreaming about using drugs again or getting high. While cravings can be unsettling and may lead to relapse, they are something people going through withdrawal typically experience. That is, unless they are on a medication regime, like in a Naltrexone implant clinic. Opioids bond with certain neuroreceptors in the brain that give people both relief from pain and the euphoric and high feeling that comes with the drug. These are very specific neuroreceptors that need to be available, and if they are not available, the opioids do not bond with anything else, and will not have much of an effect on the individual anymore. Naltrexone is a prescription medicine that actively bonds with those same neuroreceptors as opioids, but does not provide with those same high and euphoria as opioids or alcohol would. The brain’s neuroreceptors are missing their usual bond with opioids, so they are telling the brain that it needs them, now, which is where the cravings come from. With naltrexone, the neuroreceptors are in use, so they are not giving off the craving signal, and the person can go through withdrawal and recovery with having limited cravings. The idea here is to help the individual through the recovery process as easily as possible. The other benefit that comes with naltrexone, and can help prevent relapse, is that it effectively ruins the high that a person would get if they start using again. The naltrexone implant is continuously releasing the medication in the body, so the neuroreceptors are not available to any drugs that the person may use. They will not get high if they use again. By ruining the high from narcotics, it cuts the chances that they will relapse. Now, naltrexone may sound like a miracle cure for addiction. It is easy to see why people may think that if it reduces cravings, so the addiction is cured right? No. This is just a possible treatment for the biological part of addiction. Substance use disorder is much more complicated than that, and if a medication is the sole form of treatment, much of the problem will be missed. Opioid addiction is often a way to escape from a problem that already exists, like an untreated mental illness, relationship issues, or financial problems. In other words, there is often an underlying condition, and the person was using drugs or alcohol as a way to treat it themselves. If a person begins taking naltrexone as a means to fix the addiction, well, the cravings for the drug might be minimised, and the biological need for it may be gone. The problem is that the underlying problem will still be there, and the use of drugs or alcohol as a quick fix and a coping skill will still be in their head as the go-to method when something is wrong. So, the psychological aspects of addiction still need to be addressed in treatment. A naltrexone implant is a small pill that is inserted under the skin. It slowly releases the medication throughout several months. This is a more effective form of the medication, as one dose, either taken orally or in a shot, of naltrexone will usually work for 2-4 days. Then it needs to be taken again. With an implant, the medication is released continuously and will last for months, with no chance of the person missing a dose, forgetting an appointment, or skipping it to start using again. Like most medications, naltrexone has few side-effects and can be used with relative safety. What some people have experienced is increased tiredness, anxiety, or sudden changes in mood. Due to its effects, naltrexone is not recommended for people with kidney or liver disease. Naltrexone is prescribed only after you’ve stopped drinking alcohol or taking opioids. It is important to tell people that once they start using naltrexone that they should avoid using opiates of all kinds. In the beginning, naltrexone will trigger withdrawal symptoms in some people. A person who is newly on naltrexone and takes an opioid can put themselves at significant risk to their health and life. Naltrexone may not be approved in all countries for the treatment of addiction, but there are some studies coming out demonstrating its utility in treatment. Studies in Europe have shown that naltrexone helps increase the commitment to recovery and lowers the risk of relapse in people who use it. A naltrexone implant will lower that risk further it is thought since doses cannot be missed. What is known is that medication combined with traditional counselling and support groups provide some of the best chances of living a life in recovery. Naltrexone has not been shown to interfere with a person’s quality of life or their enjoyment of the fun things in their life. A research report contributed to by The King’s College London, England compared the effects of naltrexone implants and methadone treatment on heroin and other illicit drug use for the outcomes of addicts after prison release. It concluded that Naltrexone implants might be a valuable treatment option in prison settings. A naltrexone implant may be another tool in the fight against addiction. A person with a serious substance use disorder, using opioids like oxycodone or street drugs like heroin put their lives at risk when they use. Opioids are deadly when used often enough and in large enough doses. 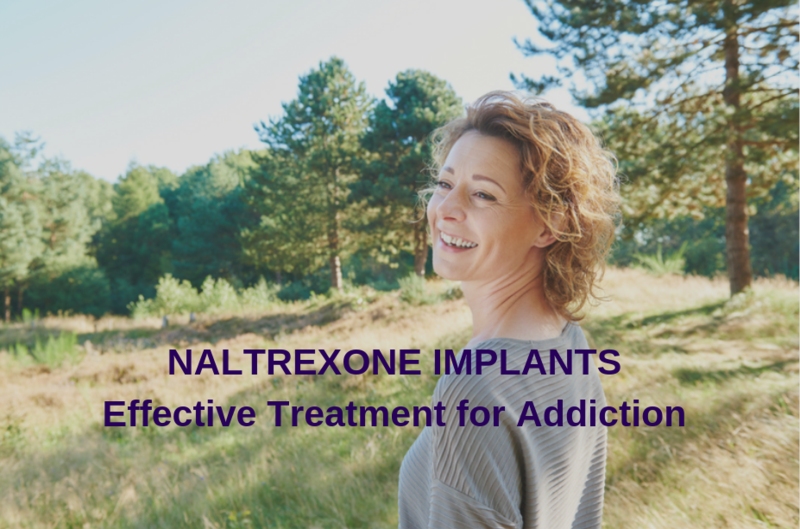 If using a naltrexone implant can remove that high feeling and cut back cravings, it can give people with an addiction a strong chance to overcome it, and help treat the underlying causes. A naltrexone implant gives people the relief they need, and the chance they deserve, to finish treatment and live a life in full recovery. Improved outcomes may be physical because there is a more steady blood level and patients don’t forget their medicine. The outcomes may also be partly psychological because once a patient receives their implant, they don’t have to decide every day whether or not to take their Naltrexone or consider relapsing.